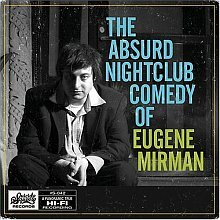 Endorsed by comedian David Cross (who wrote the liner notes for this CD), and as seen on Conan O'Brien and Comedy Central, comedian Eugene Mirman has quite an impressive resume. And, on his latest CD, The Absurd Nightclub Comedy Of..., you get a glimpse of why he is growing in popularity. The Absurd Nightclub Comedy Of... has some funny bits, including humorous takes on steaks and steakhouses, the Jewish faith, the movie Teen Wolf, gay marriage, and stalking, among other things. Though, the comedian pads the funny jokes with a lot of filler, making this 48-minute disc a hit-or-miss collection of fifty-percent good and fifty-percent filler. When Mirman is on, he's on. But he's not always on, not like comedian David Cross, Mirman's friend who raves out Mirman throughout the liner notes. There is a bonus DVD in this CD, which includes four short films. The DVD does a good job of making up for the filler on the CD; but you're still left seeking Mirman to step up his game a bit. I'll give this a B-.